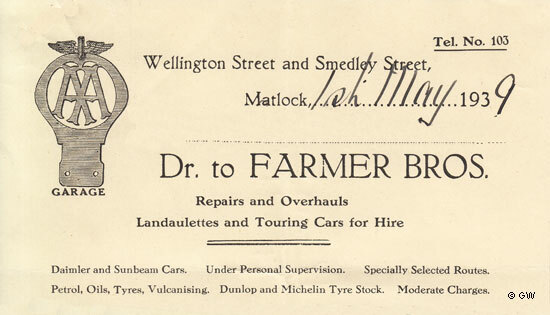 A series of letterheads found on stationery used by Matlock and Matlock Bath businesses from 1900 to the shortly after the Second World War that range from very simple to more ornate designs. They cover a wide range of local commercial enterprises, from hydros and hotels, to architects, banks, builders, butchers, chartered accountants, chemists, the Co-op, decorators, doctors, estate agents, garages, a gas company, grocers, greengrocers, hair preparations, insurance agents, jewellers, laundrys, manufacturing (hosiery), masons, mills, opticians, plumbers, poulterers, pubs, quarry owners, registrars, solicitors, surveyors, timber merchants, undertakers, valuers and wine merchants. In other words, everything you would expect to find in a Derbyshire country town and village at that time. There are estimates, invoices, letters, memos, notes, receipts and statements, although only the letter heading is shown here. Amongst the collection are also three unused cheques, a shopping reminder and a returns list for bottles. The full sheet has been provided in a few instances, but the body is blank. The images are almost exclusively from Glynn Waite's collection. Member of the National Federation of Fruit and Potato Trades Associations. Matlock UDC. He was based in the Town Hall. Else & Son, 1909 - Auction & Estate Agents and Insurance Agent. John Else was listed in the 1871 census. He was involved in the Great Matlock Will Case (see court report | article). 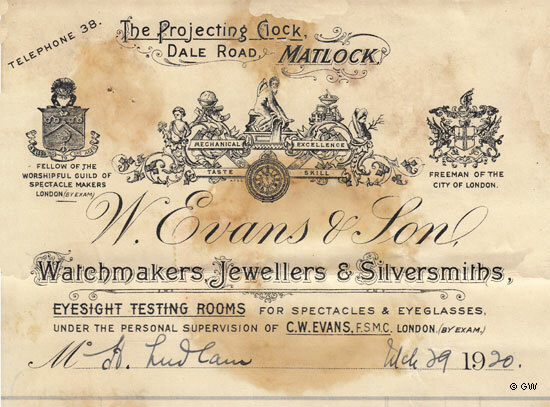 W. Evans & Son, 1920 - Watchmakers, Jewellers & Silversmiths. He had also become a Freeman of the City of London. 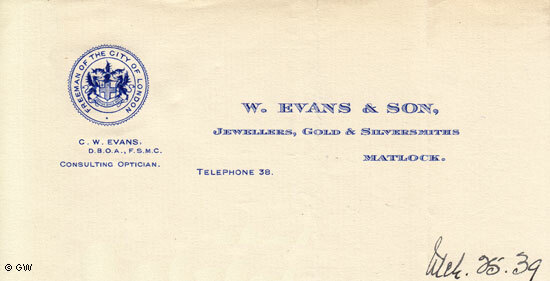 Charles Walter Evans had taken over the family business. Greatorex & Son, 1928 - Limestone Quarries & Tarmacadam Manufacturers. T. Greaves & Co. Ltd., 1947 - Furniture. Thomas Greaves had started his furniture business in Clay Cross about 1994. The Bank Road store was listed in Kelly's 1941 Directory. Haydn Stanley eventually bought the business in 1982. 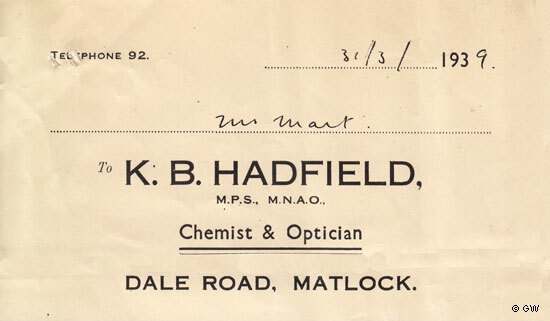 Kenneth Bramwell Hadfield, 1939 - Chemist & Optician. This was a family business, originally James E Hadfield on Dale Road. Robert Hall, 1903 - Incorporated Accountant, Insurance Agent and Estate Agent. In April 1967 the London Gazette announced a Meeting of Creditors prior to liquidation. 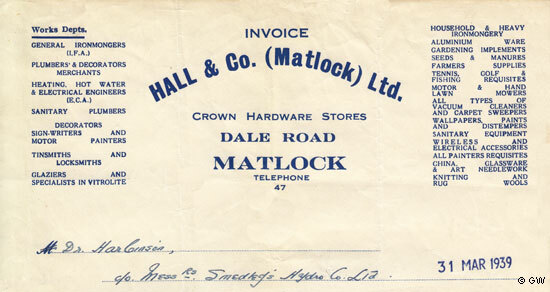 Hall & Co. had been in business on Dale Road for over 65 years. 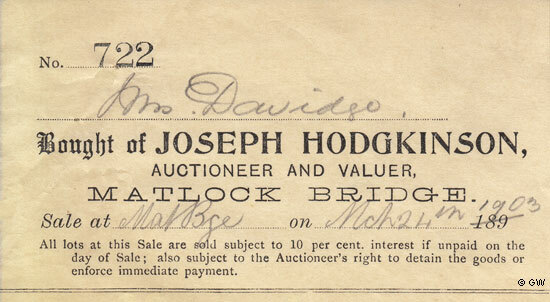 CGH moved to Matlock from Worcester between 1901 and the date of this letter. Alfred Heny died on 9 April 1918 (with thanks to Cheryl Giacchetti for the date). The Duffield practice was no longer mentioned. All images © GW are in the collection of, provided by and © Glynn Waite.